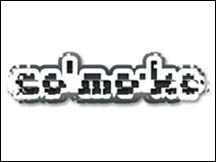 ‘co-mo-ko' presentation consists of realization of a game for mobile phone. The first stage for the project consisted of creation of several games and presentation in the space of gallery. The scenarios of games were made to research the possibilities of equipment and self - identification of the viewers' area of perception. They are referring to classic computer games on concept level; however they are creating new, individual mobile quality visually and in the sense of content. ‘co-mo-ko' presentation as one of the events included in the Mobile Webcast Studio consists of realization of a game for mobile phone on a map of Lakowa street (which is placed near to Laznia and has a specific atmosphere). Making available it for download on the internet site and organization of one or more days in Laznia during which this and other ‘co-mo-ko' applications could be loaded on own mobile phones or talking with its creators. The suggestions about applications will be taken into consideration during the event, so the project will have a character of interaction and the viewers will have the possibility to receive files for their own modifications. - defying a basis of terms needed for interpretation in artistic categories works created for mobile phones.